From left to right: Felipe Leal, CBC Kingsville Campus Director; Donna Atkins, QEP Curriculum Chairperson; Christy Lansford, CBC Foundation Executive Director; Sylvia Martinez, CBC Bookstore Specialist; and Dr. Twila Johnson, CBC Dean of Academics/QEP Director gather to celebrate the launch of the new student success course being implemented in fall 2013. 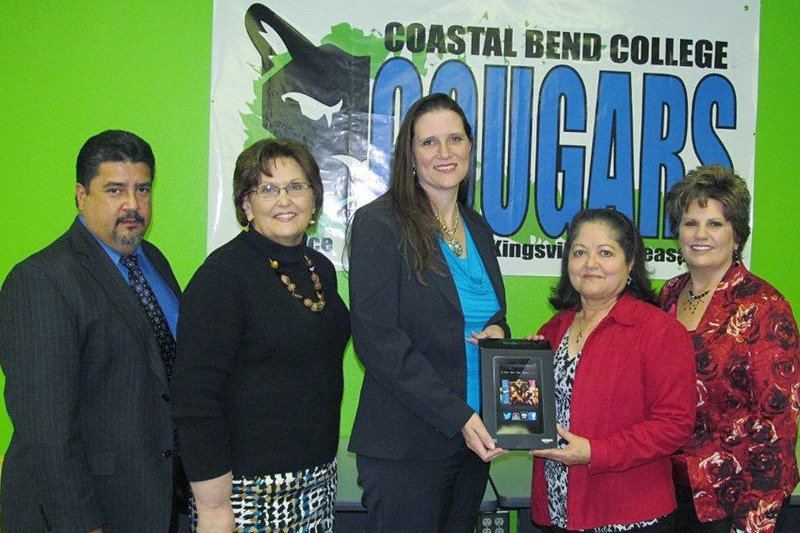 The CBC Foundation also awarded Martinez with a Kindle Fire because she won a contest to name the new course. Thanks to Martinez, the course is now titled My COUGAR Course. Coastal Bend College is excited to announce the launch of My COUGAR Course—a student success course designed to equip students with tools to improve their college readiness and success. My COUGAR Course was created after research and data was collected from CBC instruction materials, survey results, focus groups and best practices research. Based on this research and data, the CBC Quality Enhancement Plan (QEP) Team designed the course to help teach and empower students to develop essential assets, knowledge and skills found in students who are college ready and successful. Some of these assets include being an effective communicator, demonstrating creative/critical thinking skills, and developing a college/career pathway. My COUGAR Course is mandatory for all first-time students who have earned less than 12 credit hours at CBC, and is also mandatory for students have not met Texas Success Initiative (TSI) requirements. Students enrolling in the class will register for EDUC 1300, which is generally accepted as an elective at the university level for students who transfer after attending CBC. By taking the class their first semester at CBC, the student can perform better in subsequent semesters at CBC or a university. Furthermore, the student will learn lifelong skills for success that can be used in or out of the classroom. The course will be taught by qualified faculty who must also complete a 16-hour certification workshop before being able to teach the My COUGAR Course. During the certification workshop, professors will learn best practices to use in their classrooms to create a course that will garner positive student learning outcomes. The professor will encourage and teach students to be active in the college community, proactive about assignment deadlines, and help them with note taking/study skills, in addition to helping the student build assets for success. Support for students enrolled in My COUGAR Course reaches far beyond the walls of the classroom. In addition to having a professor available to them, students also have access to services/personnel from advising, financial aid, tutoring, mentoring, job shadowing, and other student services that serve a pivotal role in providing information and support to students. “My COUGAR Course is designed to create a sense of community between the students, CBC faculty and staff, and the environment. Overall, these strategies, tools and insights learned in the course will insure students have the knowledge they need to succeed at CBC and anywhere else,” said Dr. Twila Johnson, Dean of Academics at CBC. The course will be offered at all CBC sites in hybrid and online formats beginning fall 2013, and registration for the course will be available in mid-March. For more information about My COUGAR Course, contact your local CBC advisor or contact Dr. Twila Johnson at 361-354-2529. At CBC, your future begins here and now. Let CBC and My COUGAR Course help you succeed.